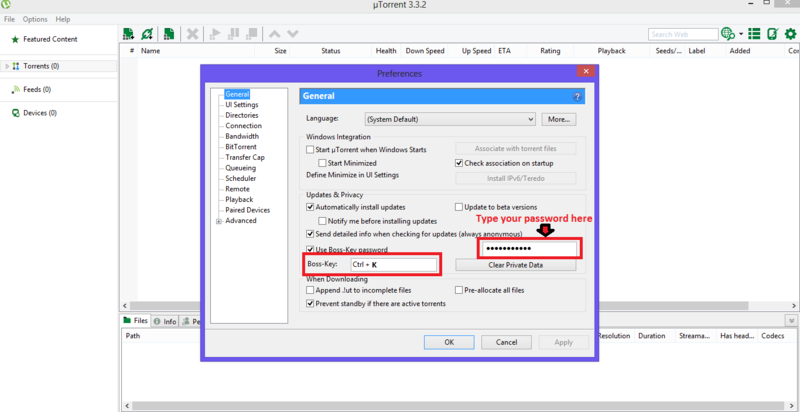 How to Password Protect a torrent while downloading file: Have you ever thought to password protect your torrent client while your downloading is still on?? This is possible, you can do it. This option is known as Boss-key Password. Every torrent client provides an option to password protect it, so that no one else can see what you are downloading. Every keen internet user uses torrent client for downloading purpose. But it sometimes become difficult when you do not want to expose what you are downloading. 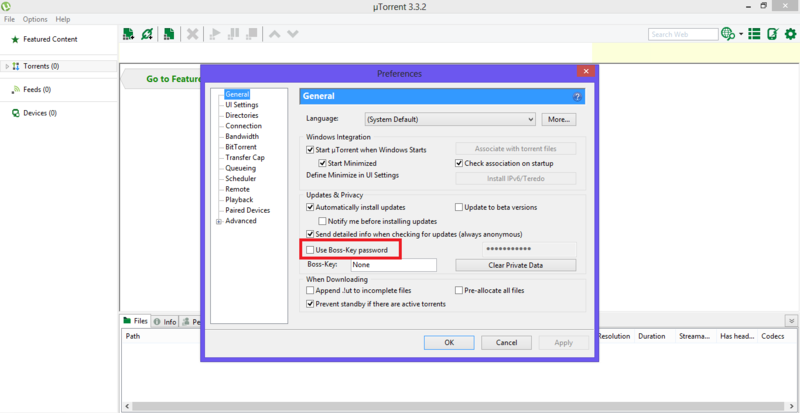 So, I would help you through this article to password protect a torrent downloading file. Torrent is the leading sharing client to distribute big files over internet. It is a protocol which supports peer-to-peer file sharing. It was designed by a Programmer, Bram Cohen, in 2001. Some of the torrent clients are Bit Torrent and µ Torrent. A torrent file contains metadata. Then, the binary file is distributed among the internet users. The best pro available in it is that the downloading of file can be stopped and resumed anytime as it downloads the file in small chunks called pieces. Every piece is collected from different sources and is assembled at the end. In 2009, Bit torrent had the most active users as Facebook and YouTube combinely had. But it had been frequently criticized for its piracy content. But yet it is used widely all over the world. Open your torrent client. Click on OPTION menu. Go to PREFERENCES. You can use “Ctrl + P” as shortcut key for it. A new window will appear on your screen. You will see a “Use Boss-key Password” option. Click on the small box before it. Now, fill the column just below it i.e “boss key”. Hold Ctrl key and press any alphabet eg: Ctrl + K. This would be your keys to lock or unlock torrent client. NOTE: Do not use boss key as any windows shortcut keys like Ctrl +A. It will lead to confusion in future. Now fill the password in the given box. Press enter and you are done. Now, Press your boss keys to lock your torrent client. To open your torrent client, press your boss keys like Ctrl +K. It will ask for the password. Type your password and press enter. Your torrent client will open and your downloading will be running as it is. If you have any query regarding this article then feel free to contact me by filling the below form. Previous articleBest file managers for android phones and tablets. Next articleHow to open (sign in) multiple email accounts (more than one) on Gmail using same browser.